DR has brought many improvements to the way that X-ray images are captured and processed, but it has created new challenges as well. Although DR has increased the efficiency of obtaining, storing, and retrieving images and reduced the number of repeat examinations, it also requires a more complex set of protocols than film. Generating a clinically useful image while keeping radiation dose as low as possible is a constant balancing act due to variations in patient body masses and types. Nowhere is that balance more precarious than in pediatric radiography. To help technologists more safely and effectively image children, researchers with the Image Gently campaign have developed a checklist that outlines the critical steps in DR workflow, with an emphasis on steps that affect radiation exposure and image quality. The Image Gently working group developed the checklist over a nine-month period. Because no one in the group had ever constructed a checklist, the members used World Health Organization surgical checklists and aviation industry checklists as models. When the DR checklist was ready, the working group tested it at a children’s hospital and incorporated technologist feedback to refine it. John says one challenge in constructing the checklist was that there aren’t a lot of well-organized studies detailing the common errors that occur in DR. 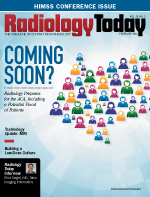 The working group mainly had to rely on information from technologists who work in pediatric radiography as well as a broader American Society of Radiologic Technologists survey from 2010. Through this process, several important factors were identified. Other aspects of DR technique that can affect patient exposure are beam collimation, proper use of shielding, and proper technique for the body part that’s being imaged. Because technologists already are very busy, the checklist was designed so they can proceed through all of their normal steps with only four pause points, which John says reflect natural pause points in a technologist’s typical workflow. The pause points roughly correspond to the periods prior to starting the exam, capturing the image, checking for image quality, and during postprocessing. There’s a downloadable trial version of the checklist that can be printed out in any format. John says technologists can fill out individual sheets to track departmental improvement or the checklist can be printed as a poster to hang in the pediatric radiography area. It even can be printed as a wallet-sized card for personal reference. Along with improving the safety of pediatric DR, however, John thinks the checklist can be useful for data collection. The checklist can be formatted as an Excel spreadsheet, and technologists can enter the values at predetermined intervals. A department, hospital, or system of hospitals then can use that data to verify that they’re taking the appropriate steps to reduce pediatric radiation dose while developing a searchable database of pediatric DR dose data. John believes other modalities may benefit from using checklists, too. CT and MR, although their protocols are highly variable, share some of the same issues as DR, such as accounting for patient size and establishing proper fields of view, and may benefit from the development of a checklist tool. As medical imaging processes become increasingly complex, checklists are one way to maintain quality.